We support your fly fishing life from the linguistic aspect. Our team consists of a native Japanese speaker and an native English speaker, which enables us to understand fly fishing in 2 languages. Probably you are an English speaker, since you are here. Do you need any help? Many foreigners living or fishing in Japan have told us that they didn't know where and how to get information on fly fishing. The internet, magazines, books carry lots of information but they are nearly all in Japanese. English information on fly fishing in Japan is extremely limited. This fact shows that there are quite a few foreigners living and working in Japan who are dying to fly fish here but in reality some of them have no choices but to tranquilize their passion and find another hobby available. However, Japan still has many opportunities for them. If you are in the market for fly fishing gear, tying materials, tackle, etc, in Japan, why go somewhere else? We carry tying stuff and tackle, although we have few rods and reels. But we can hook you up with our partner shops which carry what you want. We really want more foreigners to enjoy fly fishing in Japan. Occasionally foreigners contact us for domestic fishing information and we know they are helpless. 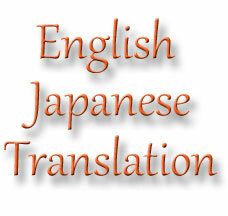 If you need English-Japanese translation, we are here. We help you with what you want promptly at reasonable cost. It is not a big deal for us to translate website, article, book, brochure, catalogue into the other language. Don't hesitate to go out for fly fishing in Japan. We help any businesses from other counties. If you are willing to start something in Japan but has language barriers, contact us. Making a Japanese website, a catalogue, contacting a distributor, retailer, lodge, etc should be difficult without a fly fishing professional. There are many good translators out there but few understand fly fishing jargon. We will hear your request and discuss it. So please feel free to contact us. Fee has to be pre-paid. Postage, communication expense may be quoted. Sample letter has 178 words. Fee is ￥1780.